However, we do not always take into account the perspective or knowledge of a person we are interacting with. Boaz Keysar and laterIan Apperly developed an experimental psychology paradigm which allows us to investigate people’s tendency to take into account the perspective of another person (referred to as the “director”) when they are following his instructions to move objects on a set of shelves. Some of the slots on the shelves have a back panel, which prevent the director, who is standing on the other side of the shelves, from seeing, and knowing, which objects are located in the slots. While all participants can correctly say, when queried, which object the director can or cannot see, adult participants, approximately 40% of the time, do not take into account the view of the director when following his instructions. In a previous study, Sarah-Jayne Blakemore (UCL), Ian Apperly (University of Birmingham) and I, demonstrated that adolescents made more errors than adults on the task, showing a greater bias towards their own perspective. In contrast, adolescents performed to the same level a task matched in terms of general demands but which required following a rule to move only certain objects, and did not have a social context. Presentation of multitasking paradigm (image published in Royal Society Open Science paper). 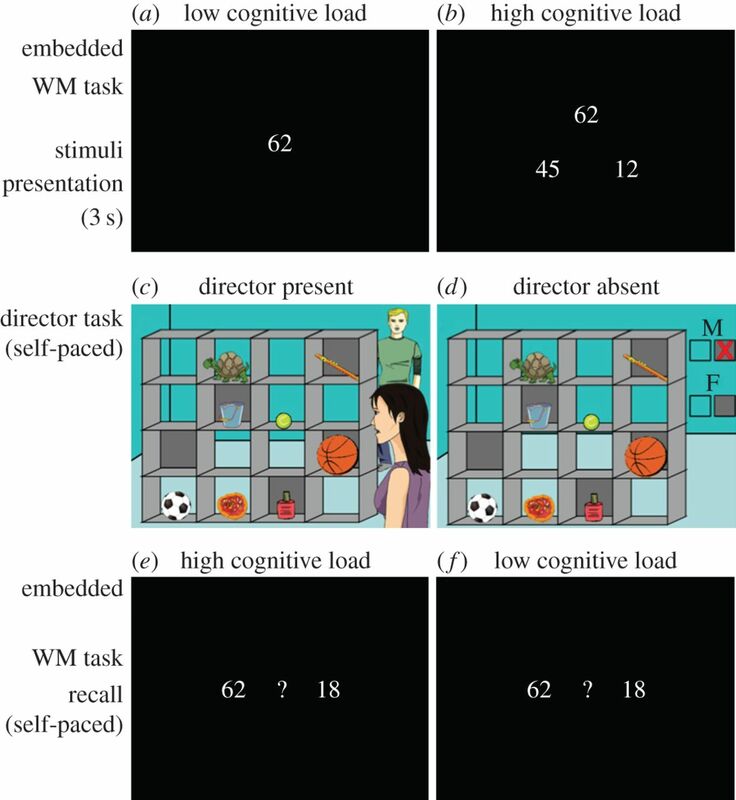 For each trial, participants were first presented with either (a) one two-digit number (low load) or (b) three two-digit numbers (high load) for 3 s. Then participants were presented with the Director Task stimuli, which included a social (c) and non-social control condition (d). In this example, participants hear the instruction: ‘Move the large ball up’ in either a male or a female voice. If the voice is female, the correct object to move is the basketball, because in the DP condition the female director is standing in front of the shelves and can see all the objects, and in the DA condition, the absence of a red X on the grey box below the ‘F’ indicate that all objects can be moved by the participant. If the voice is male, the correct object to move is the football, because in the DP condition the male director is standing behind the shelves and therefore cannot see the larger basketball in the covered slot, and in the DA condition the red X over the grey box below the ‘M’ indicates that no objects in front of a grey background can be moved. After selecting an object in the Director Task, participants were presented with a display of two numbers, one of which corresponding to the only number (e) or one of the three numbers (f), shown to them at the beginning of the trial. Participants were instructed to click on the number they remembered being shown at the beginning of the trial.